Is building a deck on your to-do list in the coming weeks or months? More homeowners today are turning their deck into a DIY project. This choice makes sense for those looking to save time and money. That said, there are a number of intricacies with building a deck that a lot of folks don’t know about. Even one mistake could set you back hundreds of dollars or more on materials. That’s why it’s imperative to build your deck correctly the first time. 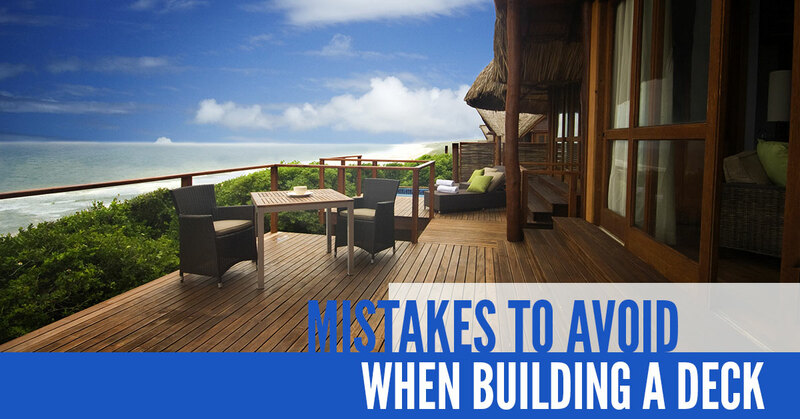 In this blog post, we will dive into the most common mistakes to avoid when building a deck. Not applying for the necessary permits – This should be done long before you purchase any materials or begin any prep work. Check with your subdivision and homeowners association for required permits. You will likely have to submit drawings and specifications. An alarming percentage of homeowners fail to go through this step because they’d rather not pay the fee associated with deck permits. However, if you finish your deck without the required permits, a local authority or inspector could demand you tear it all down. By having the necessary permits, you’re allowing inspectors to ensure you new deck meets all safety codes. Not planning for the right clearance and access – Depending on the location of your deck, you may have to figure out how to deal with access that would be restricted or blocked by new construction. Don’t forget to look at basement egress windows, outdoor water faucets, air conditioning units, exterior lighting, drainpipes, and electrical outlets. Keep in mind that service panels for electrical, cable, phone systems must remain accessible. Selecting poor-quality materials – Today’s decking materials are made of wood, plastic, vinyl, and composite. As the decking industry has grown, so too have the number of choices for homeowners. With that in mind, no two materials are the same quality. In order for your deck to last a long time, it must be constructed from top-of-the-line materials. The temptation is definitely there to skimp on material cost for your deck. But if you want a safe, beautiful deck for years to come, always go with the best materials. Not adding stairs – Especially for families with young children and older adults, stairs are a must with decks. They should provide both access and an escape if necessary. Steer clear of stairs that are overly steep or narrow. Pro tip: leaving any open space between stairs can be hazardous since feet can easily be caught in the openings. The last thing you want is falls and injuries to result from this mistake. Not trusting a professional – When it comes to it, building a deck isn’t the ideal DIY project. This is where experienced local deck builders come into play. At Ready Decks, we’re different from other decking companies in that we provide the highest quality site-built decks in the shortest time possible while offering homeowners the greatest value. Rather than hire just any deck installer or deck contractor to handle the job, give Ready Decks a call. Specializing in beautiful, long-lasting, and affordable decks, we have a solution for you.